Natural voice will be a game changer, said Ian Beavis, chief strategy officer of AMCI. GM is experimenting with an AR windshield. With the advent of the 5G high-speed wireless network, we’re coming upon a new era in which cars will be another IoT device. Recalculating: That’s not just your GPS system signaling a change of direction. It also applies to the auto industry overall, with the potential for emerging technologies to upend our assumptions about the driving experience. In 2018, we are in a transition period. Years ago, carmakers used to compete on horsepower. Now it’s all about seamless integration with a digital lifestyle. As consumers continue to wrap their minds around that concept, automakers are moving ahead, attempting to fulfill needs that consumers might not know they have. Here’s a look at the technologies they’re testing on the road to consumer acceptance. Picture yourself stepping into your car, and your car greets you. Then it gives you a rundown of traffic and weather conditions and suggests a new podcast episode you’re likely to enjoy for your ride. In 2018, that vision is still a fantasy. Though voice control has been available in cars for more than a decade, consumers find the systems’ limitations frustrating. A 2016 Strategy Analytics report, for example, found that drivers were using the systems less because they expected more than the systems could offer. In 2018, then, the goal isn’t voice recognition but natural voice recognition—meaning speaking plainly rather than using a list of prefabricated commands. Older car systems were built into the cars and had limited memory and computing power. But newer systems are cloud-based and may offer the ability to talk to your car without learning a list of commands. Ford, for example, has integrated Amazon’s Alexa into some models. Others have integrated Apple’s Siri, Amazon’s Alexa, and Google Assistant into their dashboards. Some carmarkers are taking a different approach. Hyundai’s AI-fueled Intelligent Voice Assistant, due in 2019 models, can understand compound commands, such as, “Tell me what the weather is like tomorrow” or “Turn off the lights in the living room.” Hyundai has been working with partner SoundHound to make proactive suggestions, too (such as to remind you of an event). The Mercedes-Benz User Experience, meanwhile, uses AI to understand that when the driver says, “I’m cold,” the car should turn the heat up a few degrees. Natural voice will be a game changer, said Ian Beavis, chief strategy officer of AMCI. “It’s the moonshot that everyone wants to get right,” he told CMO.com. That staple of car marketing, the test drive, is being taken in new technology-enhanced directions with the emergence of AR and VR integrations. Buick and Kia showed off VR-based test drives at the Beijing Auto Show back in 2016. Peugeot has also used VR to let consumers take test drives from their couches. More recently, Cadillac has persuaded dealers to offer virtual showrooms. Some Audi dealerships let customers check out the automaker’s entire line via a VR simulation. “We will see more of this kind of thing at shopping malls and arenas where people gather,” said David Kiley, an Ann Arbor, Mich.-based auto industry analyst. Another application for AR is in the car itself. GM, for one, is experimenting with an AR windshield. Such a feature could highlight cyclists so the driver can’t miss them or run Facebook feeds, directions, and weather alerts. VR and AR have other applications, too. A few years ago, for example, Audi’s app let owners point their tablet or smartphone at items in the car or engine for descriptions about those parts and advice on how to fix them if they’re broken. With the advent of the 5G high-speed wireless network, we’re coming upon a new era in which cars will be another IoT device. Actual use cases are sparse so far, though a good example is GM’s Cadillac CTX sports V2V (vehicle to vehicle) communications technology, which lets it talk to other Cadillac CTXes. If you’re driving a CTX and another model further ahead of you encounters a hazard on the road, for instance, it will communicate that information. GM has also tested V2X (vehicle to everything) technology with a smart traffic signal that informs the driver whether to brake or hit the gas when a yellow signal changes to red. For its part, Ford has announced that its V2X technology will be on the roads by 2019. 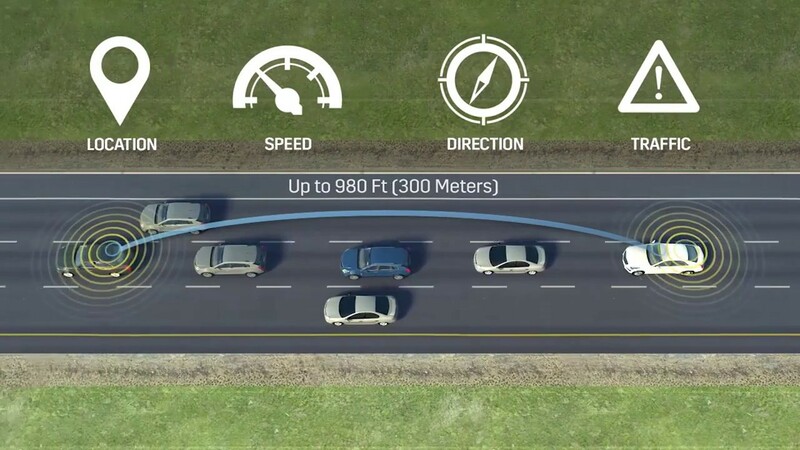 The chief benefit of V2X is safety; cars can use it to broadcast their speed, steering-wheel position, brake status, and other variables to other vehicles and objects within a few hundred yards. The National Highway Traffic Safety Administration believes V2X could prevent more than 500,000 accidents and 1,000 fatalities a year. It’s conceivable that, further down the road, V2X could do other things, too, such as alert a driver when a gas station is nearby when the tank is on empty or flag a 7-Eleven when the car knows its driver needs to pick up milk on the way home if the system is linked to a smart refrigerator. Imagine Apple’s Touch ID for your car. Actually, Gentex takes the idea further by using eye recognition in the rear-view mirror to recognize your irises to start your car. Though there are few examples yet of implementations by major automakers, Lanctot said that automakers and their suppliers “are becoming obsessed with personalizing [and securing] the driving experience.” Biometrics offers both a security and personalization solution. “The car will identify you, the driver, by your presence and pressure on the driver seat, sensors in the seat belt, facial-scanning embedded in the headliner or dashboard, and maybe even sensors in the steering wheel, along with gesture recognition,” he said. The downside? Privacy concerns, Lanctot said. That said, drivers might accept the trade-off if it delivers a more pleasing driving experience that anticipates destinations and other driving decisions. “All will be tuned to identify you and your every need,” Lanctot said.